Antigua, south of the country’s capital Guatemala City, sits at an altitude of 1,533 metres. This beautiful city was capital of the Spanish captaincy of Antigua Guatemala, was once the most important seat of the Iberian government between Mexico City and Lima, Peru. I loved Antigua! 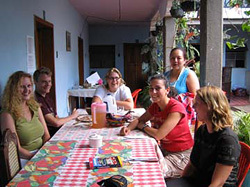 If you’re looking for a Spanish immersion course in a charming, inexpensive location, then choose Antigua, Guatemala! It’s a relatively small city with cobbled streets, a great colonial influence, beautiful architecture, and picturesque landscapes. It has even been designated a UNESCO World Heritage Site! Perhaps what I liked most about Antigua from my very first moment here was its indigenous population. Their presence gives such a unique cultural atmosphere to the city. When here, you really must check out the Nim Pot Market, which showcases the distinct Mayan textiles and handicrafts from hundreds of nearby indigenous villages. 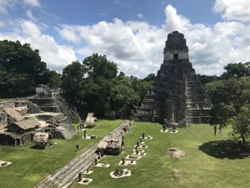 The mission of this “retail museum” is to preserve Mayan cultural identity – and they are certainly doing a great job, as it attracts tourists, locals, and visitors from around Guatemala. You can spend hours just browsing through all of the magnificent Mayan creations – don’t be afraid to get a few souvenirs for friends and family back home!